Conserved farmland at Walt's Dairy in Copake, Columbia County. COPAKE (COLUMBIA COUNTY)—Scenic Hudson and the Columbia Land Conservancy (CLC), with support from the USDA-Natural Resources Conservation Service (NRCS) Agricultural Conservation Easement Program-Agricultural Land Easement (ALE) component, Equity Trust and The 1772 Foundation, recently collaborated with the Kiernan and Sullivan families to protect 350 acres of high-quality farmland—the heart of their farm operations, known as Walt’s Dairy. By acquiring a conservation easement on this land, Scenic Hudson and CLC have ensured its permanent availability for agricultural use and that it will always remain affordable for farmers. Established in 1927, this fourth-generation dairy farm now has 400 cows. It is a founding member of Hudson Valley Fresh, a dairy farmer cooperative that produces a variety of milk and milk products such as yogurt, ice cream and sour cream sold in stores throughout the Hudson Valley, New York City and the Tri-State Region. In addition, Walt’s Dairy is a long-time member of Agri-Mark, a farmer-owned milk marketing cooperative that owns the “Cabot” and “McCadam” brand names. Walt’s Dairy was ranked the highest priority for protection among all the farms identified in Scenic Hudson’s Foodshed Conservation Plan, a data-driven blueprint for ramping up collaborative farmland-protection efforts to create a secure source of fresh, local food for the Hudson Valley and New York City. The transaction also accomplishes priority goals of CLC, including not only its farmland conservation objectives but also its work in the area of farmland access for new generations of farmers. Walt’s Dairy’s farmers were paid a portion of their land’s value to ensure its permanent protection through the conservation easement. Additionally, Equity Trust’s Hudson Valley Farmland Affordability Program funded a Pre-emptive Purchase Right (PPR) as part of the conservation easement. This resale restriction helps to ensure that all future sales of the land will be to farmers at agricultural value. In addition to its agricultural importance, the land is adjacent to the Harlem Valley Rail Trail and Taconic State Park, two popular destinations for connecting with nature and enjoying outdoor recreation. Scenic Hudson purchased the conservation easement with funds from its Lila Acheson and DeWitt Wallace Hudson Valley Land Preservation Endowment as well as monies from the USDA’s ALE Program and The 1772 Foundation. Scenic Hudson Assistant Land Conservation Director Cari Watkins-Bates negotiated the transaction in partnership with CLC Director of Conservation Programs Marissa Codey. CLC will hold and manage the easement. Over the last five years, Scenic Hudson and the CLC have collaborated to protect 20 farms throughout Columbia County. “Scenic Hudson is delighted to collaborate with the Kiernan and Sullivan families to protect land critical to sustaining the operations of one of the Hudson Valley’s most successful dairy operations. We also thank the other partners and supporters whose participation made this transaction possible,” said Steve Rosenberg, executive director of The Scenic Hudson Land Trust. “The Walt’s Dairy project represents a prime example of how organizations can work together to accomplish multiple conservation goals through a single transaction. We were pleased to cooperate with Scenic Hudson and Equity Trust and the other funding partners to protect the farm, resulting not only in the conservation of prime agricultural land but also in the permanent protection of lands adjacent to well-used and highly valued public recreation areas. We applaud the family for its vision and commitment to our region’s future. Working farms like Walt’s Dairy are a big part of what makes Columbia County such a special place,” said CLC Executive Director Peter Paden. “Walt’s Dairy originally was located in suburban Connecticut, but encroaching development forced us to move our operations to the Hudson Valley in 1985. By partnering with Scenic Hudson, Columbia Land Conservancy and Equity Trust on this easement, my family has ensured our land here will always be available and affordable for farming,” said Walt Kiernan. “Equity Trust is very pleased that the Kiernan and Sullivan families have chosen not just to protect their land from development but also to ensure that it will remain affordable and accessible for future farmers. We are happy to have had the opportunity to support this exemplary project in collaboration with Scenic Hudson and Columbia Land Conservancy,” said Jim Oldham, executive director of Equity Trust. “The 1772 Foundation is proud to play a supporting role in the protection of Walt's Dairy, which not only contributes to a robust regional food system but also respects the historic use of this beautiful property,” said Mary Anthony, executive director of The 1772 Foundation. This transaction is part of Scenic Hudson’s collaborative campaign to Save the Land That Matters Most and supports the goals of the organization’s groundbreaking Foodshed Conservation Plan. 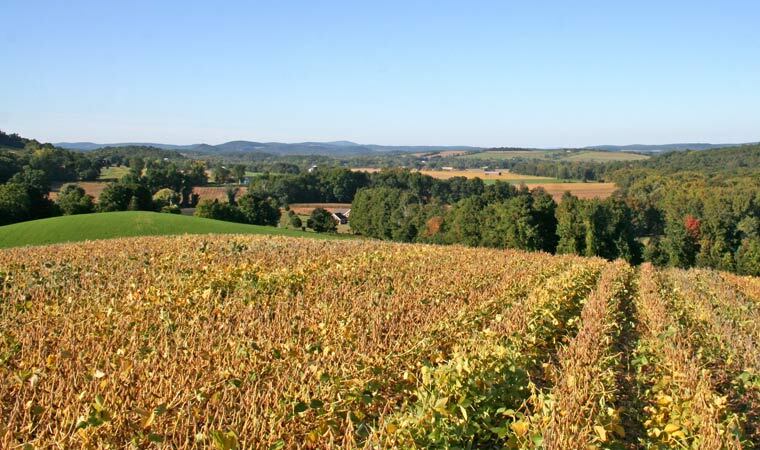 In addition to helping farmers sustain their livelihoods and support the viability of agriculture-related businesses, this growing block of protected farmland helps secure the region’s agricultural vitality, which contributes substantially to the Hudson Valley’s $800-million agricultural and $5-billion tourism economies. Conserving farms also is a buffer against rising local property taxes: Studies have shown that farms contribute more in taxes than they consume in tax-paid services. Over the past 18 years, conservation easements in which Scenic Hudson has partnered have put more than $45 million directly into the hands of farmers. This investment has helped agriculture to thrive, advanced new opportunities for young farmers and allowed farmers to invest directly in their operations—all securing the region’s supply of fresh, local food. At the same time, it has benefited communities. According to the American Farmland Trust, for every $1 invested in farmland conservation, $4 is returned to the local economy. Protected farmland also safeguards critical wildlife habitat. According to the American Farmland Trust, half of the nation’s protected species use farmland for over 80 percent of their habitat. For the past 30 years the Columbia Land Conservancy, a nonprofit organization that relies on charitable support, has worked with private landowners, businesses, government agencies and partners to preserve the county’s vibrant rural character. It has conserved more than 30,000 acres of farmland, forests and wildlife habitat for agricultural production, scenic beauty and recreation. CLC works with the community to cultivate connections to the land by providing outdoor and educational activities at our 10 Public Conservation Areas, to support agriculture by ensuring prime farmland continues to be available to the next generation of farmers, and works with individuals, towns and villages to promote land protections and smart land use planning. Equity Trust is a nonprofit organization, dedicated to equitable and sustainable land use, that has worked nationally for over 20 years to promote the protection of affordable “farms for farmers”. Equity Trust’s Hudson Valley Farm Affordability Program complements and enhances the farmland protection efforts of the many conservation groups working in the Hudson Valley by supporting the use of critical tools for keeping farmers on the land. The Program provides technical assistance to farm protection projects using these tools along with funding in the form of grants and bridge loans. Scenic Hudson works to protect and restore the Hudson River and its majestic landscape as an irreplaceable national treasure and a vital resource for residents and visitors. A crusader for the valley since 1963, we are credited with saving fabled Storm King Mountain from a destructive industrial project and launching the modern grass-roots environmental movement. Today with more than 25,000 ardent supporters, we are the largest environmental group focused on the Hudson River Valley. Our team of experts combines land acquisition, support for agriculture, citizen-based advocacy and sophisticated planning tools to create environmentally healthy communities, champion smart economic growth, open up riverfronts to the public and preserve the valley’s inspiring beauty and natural resources. To date Scenic Hudson has created or enhanced more than 65 parks, preserves and historic sites up and down the Hudson River and conserved over 35,000 acres.